I am a nail polish addict. I admit it. I have over 120 bottles. My toe nails are always painted, but my finger nails get neglected. With kids and household chores nail polish doesn't last but 2 days before chipping, so I just don't find it worth it. Until I was introduced to Gelish. 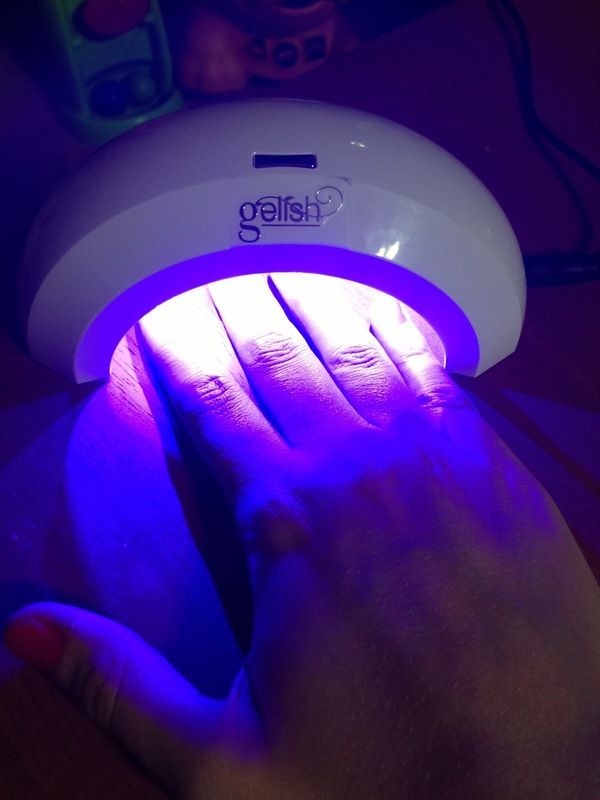 It's gel polish that uses an LED lamp to harden the polish right to your nail. This means that you can go weeks with the polish on without it chipping. I received a lamp, 4 colors of mini polish and a Basix kit. Inside the Basix kit is an instructional DVD, some tools to make your manicure easier, an artificial nail remover, Nail surface cleanse, a base, a top, a PH bond and a nourishing oil. You start by cleaning off any prior nail polish on your nails, then you use the cleanser to get your nails clean. Then you apply the PH Bond to the nail, this dries out the nail and makes it easier for the polish to adhere. Then you use the foundation gel, if you get any on your skin use the tool to clean it up before curing. You place your fingers under the light for 10 seconds. This part was weird though, it had this burning sensation around the 8 second part. It lasted about a second and I knew as soon as that feeling left my time was up. The light does get hot, so I'm attributing it to the heat. Once that's cured, you put on soak off gel polish of your choice. I went with the Gossip Girl Pink first. Once that's on, clean up again just in case and then put under the light for 30 seconds. When that's done, put on the top it off and put under the lamp for another 30 seconds. Then you put the gelish cleanser on a lint free cloth and wipe on top of the nails again. If you did the process correctly the polish should not come off at all. The polish is gorgeous. It is nice and shiny. But I did have an issue with it. Apparently I didn't clean up around my nails very well, because it was on my skin a bit. That meant that it was easy to peel back and off completely. I am a picker, but I left it alone to see. One did peel off right away, so I redid that nail without issue. The polish lasted me about a week before it started peeling from the sides, but like I say, that was my mistake. My nails are short, and I'm bound to get some polish at least on the tip of my finger. I think next time I will put scotch tape around my nails and then peel it off before I cure the main color. The polish is hard though, it literally dries with the light in an instant, If you scratch at the nail, it will not indent and scrape off. So this is TRULY amazing! I just need better precision! Once you're ready to take it off and change colors, you soak a cotton ball in the artificial remover, put it on the nail and then wrap the nail in aluminum foil for 10 minutes, then it should wipe right off. However, I was able to peel all of mine off. You can buy Gelish at Sally Beauty. Price: The lamp is $64.95, the Basix kit is $46.99 and each color of mini polish is $10 on sale right now (normally $14.95). The polishes are a bit pricey, but since they can last up to 21 days before needing to be taken off, it's worth it and you use less. Plus you only need one coat!! Overall: ***** My precision needs to improve.